I had too many great crafts to choose from this past year, but I eventually narrowed it down. In no particular order, here are my 10 favorite craft projects of 2018! Brusho Butterfly — My first big try at Brusho. Love it! 3. Week in the Life Album 2018 — Always love this project! 5. Kaleidoscope of Butterflies - Using a ton of random scraps! Today’s card is one of those card designs that I’ve been meaning to try out for some time now. I love the look of these quilted cards, but they looked like so much work. Thankfully they aren’t that complicated at all. Cut 8 pieces of DSP 1 1/4” square and two pieces of DSP or solid yardstick 2 5/8” square. From there, all you have to do is glue the pieces on. I used liquid glue so I could play with the placement and tuck pieces in before they got stuck. Easy peasy! Today’s cards have been sitting half done for months now. I had a whole stack of these unfinished cards and took a Saturday to knock them out. I had the Regal Rose card bases and smaller pieces cut for a previous card, but had sold the stamp set that I used for those cards. SO I improvised with a different stamp set. I stamped three different images from the Hand Delivered Stamp Set and had some fun coloring them. Today’s card is one of the Share What You Love CASEs that I featured at my Fall Bingo event. I slightly changed a few things from the example card, but kept it mostly the same. 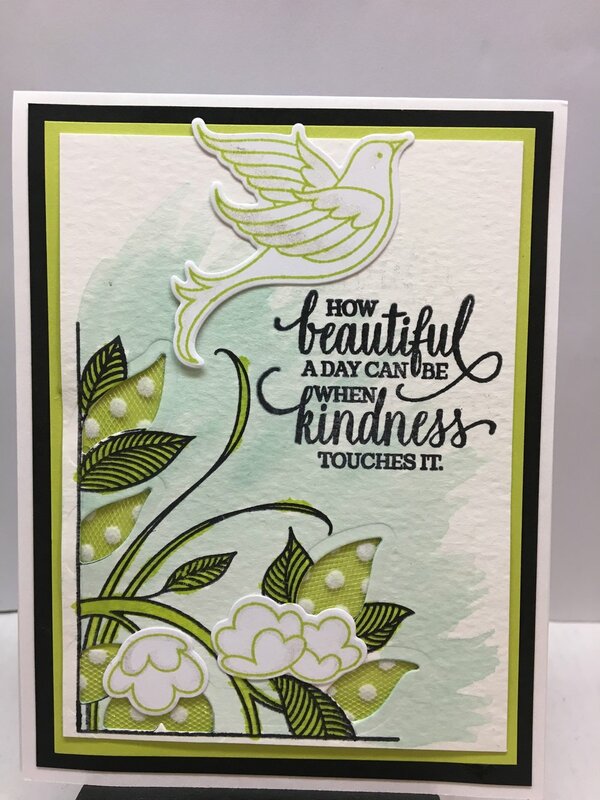 I CASE this beautiful card from Kristi Gray @ Stamping with Kristi. Today’s card is being featured on Stylin’ Stampin’ Inkspiration. The challenge was to create a card using a variety of supplies sent to me by another team member. I received this great collection of elements from the wonderful Cathy Autrey! And from those elements, I wanted to make a simple card that highlighted the stamped image and gorgeous DSP. I layered the pieces and decided to add a sentiment and an embossed piece of Pear Pizzazz cardstock to finish out my card. Love how pretty this one ended up being. 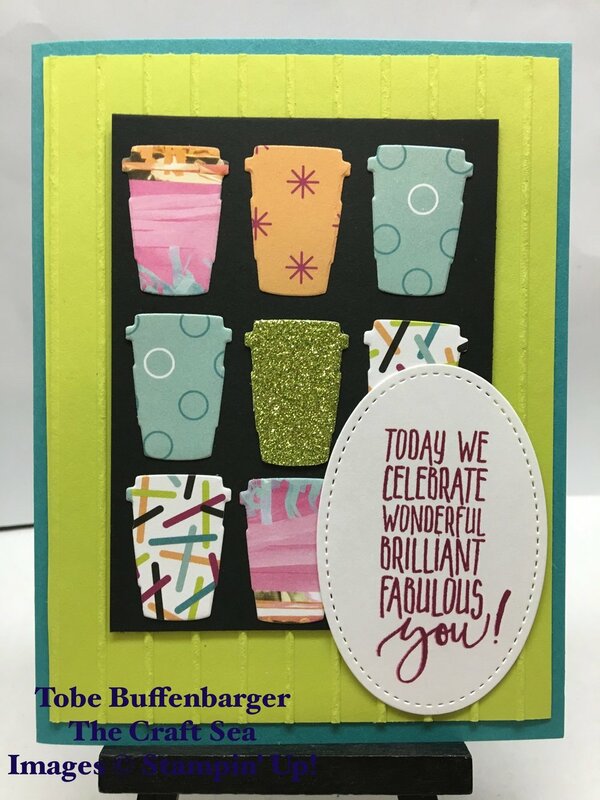 Every new catalog, my demo group does a card swap featuring lots of new products. This year's crop of cards is just great! Every new catalog, I always make a collection of cards to show-off the new In Colors. For this year's colors, I chose to use the new In Color DSP stack and the returning Daisy Delight stamp set. It's hard to choose, but I think Lovely Lipstick may be my favorite new In Color, followed closely by Call Me Clover. 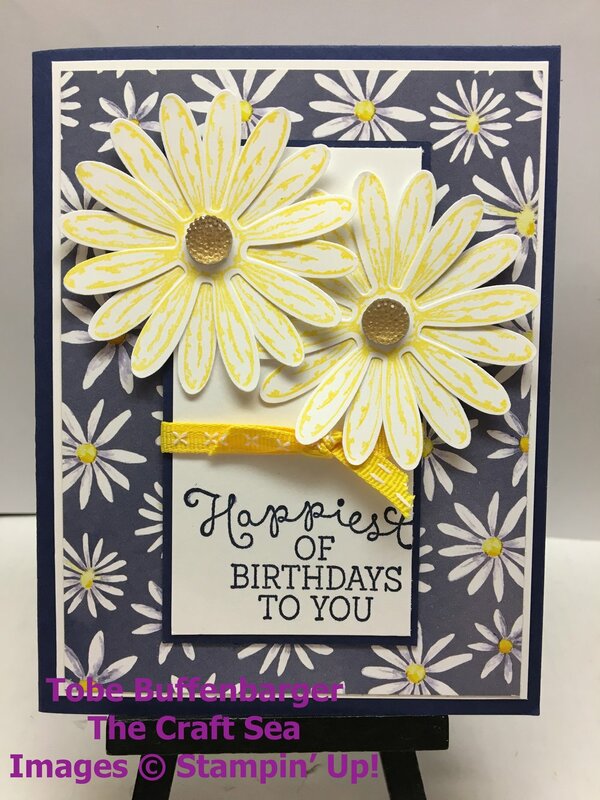 Not: I did not make a separate card with Pineapple Punch (too light for the sentiment), but I did use is for the Daisy centers. Today’s cards were half of the featured Make N Takes at my Spring Bingo event. Each Bingo participant received a goody bag with four variously colored cardstock bases, six 6x6 pieces of Delightful Daisy DSP, ten gold faceted gems, two yards of Old Olive Sheer Ribbon, and two yards of Daffodil Delight Double Stitched Ribbon. From those supplies, the ladies made two cards at the Bingo event leaving plenty of supplies to take home and use later. For inspiration, I made four different cards using the same supplies. And here's the collection of cards from the Bingo ladies! Today's post is the first of my series celebrating Arthur and Quentin's Pirate Birthday party. Being the crafter, I had to make a ton of decorations and bits and bobs with the pirate theme. I needed to make some thank you cards, settled on a design, and then couldn't decide which image to use. Instead of deciding, I made multiple of each. I stamped a bottle with different fillings (whale, octopus, or pirate ship) and fussy cut the bottles out. From there I stamped a fun background on my kraft paper with repeating images. Time consuming, but I do love the effect. The addition of the gold glitter washi tape was the perfect finishing touch. Loved these cards!